Most patients seeking medicinal cannabis on the NHS will not be able to get it soon, despite recent changes in regulation that allow doctors to give it, a committee has heard. England's Chief Medical Officer called for robust scientific trials to check safety. These trials can last years. Families with children with severe epilepsy have been campaigning for greater access. Campaigners say they have been let down. Towards the end of 2018 cannabis was reclassified to allow some cannabis-derived medicines to be prescribed by specialist doctors in limited situations. 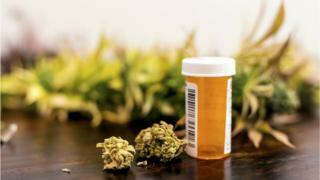 Currently medicinal cannabis is mostly unlicensed - meaning doctors can only prescribe it in extreme circumstances, and many are reluctant to do so without more guidance and solid evidence. The regulatory change came after a review by England's Chief Medical Officer, Prof Dame Sally Davies, who concluded that there were some clinical benefits to medicinal cannabis products. The Health and Social Care Select Committee heard that this move raised the expectations of some patients and families who had hoped to be prescribed the products. Speaking at the committee, Dame Sally said it was now time to build up lots of evidence from 'gold standard' scientific studies - so that the products could be considered for licensing and moved to "their rightful place in medicine." She called for industry to play a leading role in funding these trials. Peter Carroll, of the campaign group End Our Pain, said he was "shocked and horrified" that few patients had benefited so far - including children with severe epilepsy, whose parents were currently sourcing the drugs elsewhere. He said waiting years for randomised control trials to finish was "absurd". He argued that there needed to be a broader view of evidence - including the experiences of multiple families. Speaking at the committee, Prof Mike Barnes, Chair of the Medical Cannabis Clinicians' Society, said standard pharmaceutical trials could not be easily applied to cannabis, as it is not a single molecule that can be compared to a placebo or a dummy pill. He said a range of approaches needed to be taken when considering the evidence. The health watchdog, the National Institute for Health and Care Excellence, is expected to issue guidelines to specialist doctors in October. The NHS will use this to decide whether it will eventually fund the drug routinely for some patients.